annyeong !! I wore this outfit to have lunch with my family today. It was a simple outfit, and I don't think it's good enough to be posted here, but yeah, I feel I have to post something on this blog because it's been a long time since my latest post. 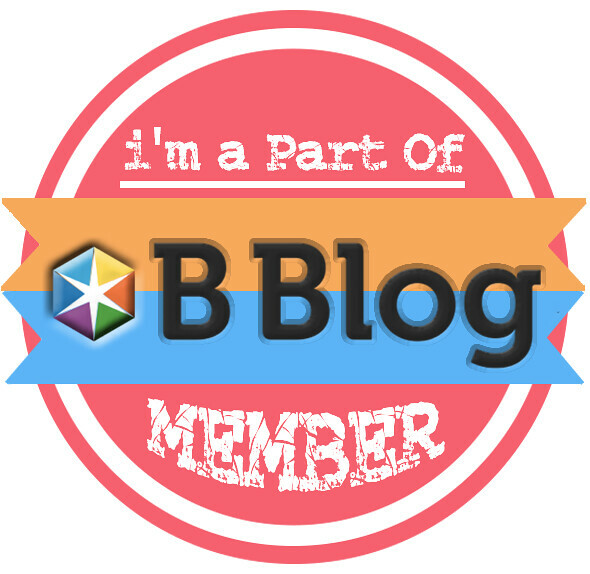 I apologize to you for neglecting this blog lately. I've been too lazy these days. 3 weeks of holiday, I only exercised once, and it was yesterday. I don't dare to know my current weight ! By the way, tomorrow I will get new classmates too. It's been 2 years I have same classmates. I'm a bit disappointed and sad that I'm separated with my old classmates and I'll get a new home-room teacher who is famous with his annoying attitude T_T. what a pity! And you look cute btw! i love ur outfit, especially the skirt! 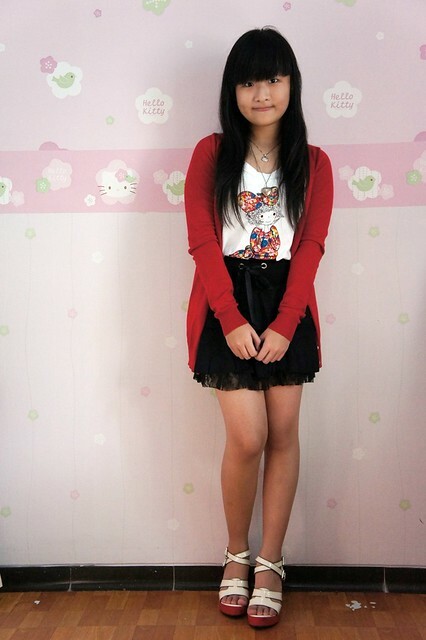 I love your wall (I have also pink walls;) and ofc your outfit as well! 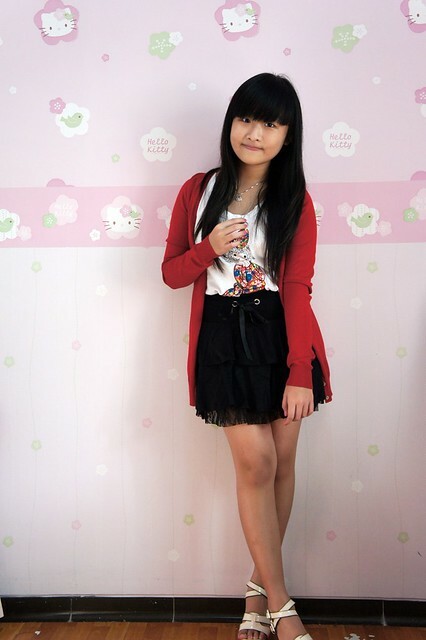 Very cute skirt, Veren Lee! I like the skirt the most in this entire outfit. Your cuteness shines again with this lovely look here. Cute wedge sandals as well. I would also like to send you my best wishes in your studies this upcoming semester. As much as I enjoy reading ".a little princess. ", I also wish you the best in all aspects of life. So do your best! That outfit is lush, simple and sweet! That skirt that u wear is so cute! Good luck for your school though, best of luck! it'd be better if u take of ur red cardigan and wear something new :p .
u will be in a new grade, and i suggest u to have a new look. just something different :) . Lovely your look ! Beautiful shoes ! nice to met you veren. you look super cute! enter Call me Diiiyn MANGO GIVEAWAY! 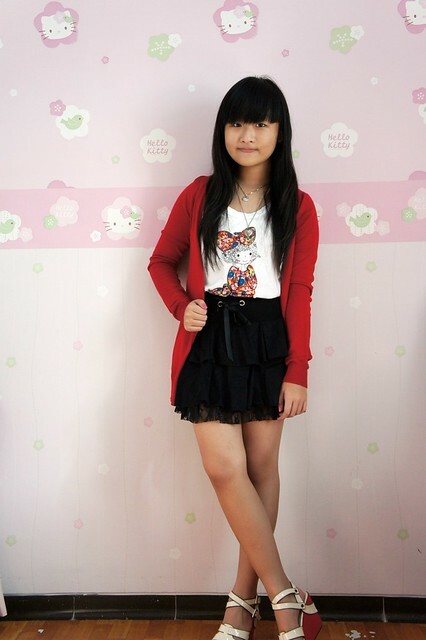 i like the outfit and the hello kitty wall!! i love all your outfits, really kyeopta. cool outfit! you look lovely with this cute tshirt! 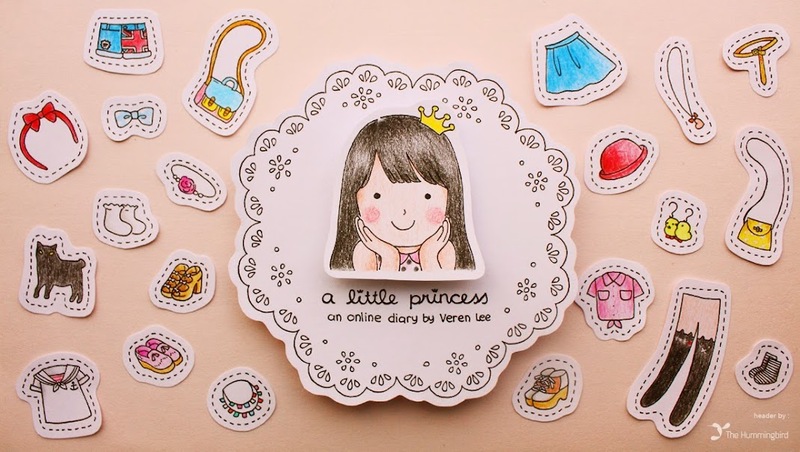 veren, you look like a teenager now:) yeap I think because of your new bangs and outfit:) cuteeee<3 http;//lisaandherworld.blogspot.com :)thanks!